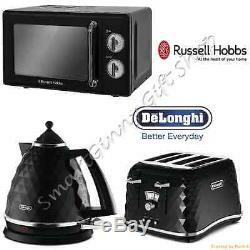 Russell Hobbs Retro Microwave + DeLonghi Brillante Kettle 4 Slice Toaster Black. Looking for a matching colour microwave, kettle toaster set or other matching colour appliances for your kitchen? You're in right place, we're also creating custom appliances sets for your requirements. And we'll answer you within 2 hours or choose colour or style below to see our full range of microwave kettle & toaster sets or other coloured kitchen appliance sets. Russell Hobbs Retro Solo Manual Microwave, 17 Litre, 700 W, Black. Compact design, ideal for kitchens with limited space. Easy to use dials, simply select the power and time. 5 microwave power levels and a defrost setting to tailor your cooking experience. Chrome handles and dials for a stylish finish. The Russell Hobbs RHRETMM705 has been designed with style and practicality in mind. This attractive appliance is simple and easy to use with its 700 watts of microwave power, providing you quick and convenient cooking in your home. With two simple control dials, you simply set your desired power level & time, and the microwave cooks your food to perfection. 1 x Russell Hobbs Retro 17 Litre Black Solo Manual Microwave. De'Longhi Brillante Faceted Jug Kettle KBJ 3001. BK, 3 KW - Black. Exclusive plastic faceted Kettle in black with chromed details. 360 degree swivel base and stainless steel concealed element. 3 kW power and 1.7 Litre water capacity. 3-level safety protection: auto shut-off when boiled or lifted and thermal cut-off. Removable, washable scale filter and non-slip feet. The traditional metal finish normally employed by Delonghi in kettle design and manufacturing has been replaced by plastic, which has allowed moulding into a 3-dimensional finish, giving the effect of cut diamonds and creating an exclusive look. 1 x De'Longhi Brillante KBJ3001. 1 x Fitted UK plug. 1 x Full product instructions. De'Longhi Brillante Faceted 4 Slice Toaster CTJ4003. Plastic faceted 4-slice toaster in black with chromed details. Features 1.8 kW of power for rapid 4-slice toasting with independent 2-slice operation. Variable browning control and variable width slots. Electronic controls for reheat, defrost and cancel functions. Extra-lift position for removing small items and extra-deep crumb tray. The traditional metal finish normally employed by Delonghi in toaster design and manufacturing has been replaced by plastic, which has allowed moulding into a 3-dimensional finish, giving the effect of cut diamonds and creating a stylish look. 1 x De'Longhi Brillante CTJ4003. 1 x UK fitted plug. ALL ITEMS SENT DIRECTLY FROM APPROVED 3rd PARTY SUPPLIERS. These items may be dispatched directly to you from a third party distributor. You must have a confirmed address. When returning an item, it must be in all of the original packaging and include all of the original accessories or items that came with it. The item and package should be in original and perfect condition. We do our best to process as quickly as possible. We request you to try your new item/s as soon as you receive them. If the item in your opinion doesn't correspond to pictures and/or descriptions, you MUST inform us within 24 hours after the item has been received; failure to do so may result in us (on our supplier's behalf) not granting you the return. If you changed your mind about the item, but nothing is wrong with the item itself e. It works properly and perfectly corresponds to pictures and descriptions, we (on our supplier's behalf) may not grant you the return. The item "Russell Hobbs Retro Microwave + DeLonghi Brillante Kettle 4 Slice Toaster Black" is in sale since Friday, January 6, 2017. This item is in the category "Home, Furniture & DIY\Appliances\Coffee, Tea & Espresso Making\Kettle & Toaster Sets". The seller is "*microwave-kettle-toaster-sets*" and is located in London. This item can be shipped to United Kingdom.